First International Computer (FIC) are a very diverse manufacturer, making motherboards, videocards, small form-factor book PC's and even Microsoft Tablet PC's. 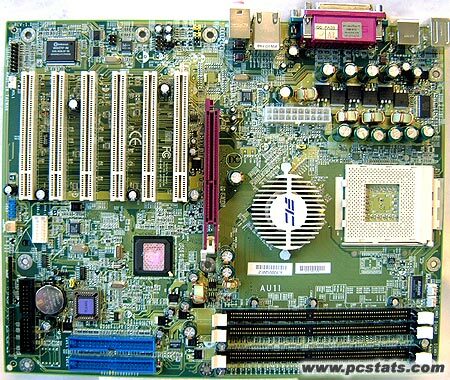 But let's not get too far off topic so soon, the motherboard we are testing out today is the nForce2 based FIC AU11 Chameleon. The previous nForce2 mainboard we reviewed was the MSI K7N2-L, and it's performance was quite impressive so we have equally high expectations for the AU11. For starters, what exactly does the FIC AU11 have to offer? Is it chocked full of USB and firewire ports, or is it just a plain and simple mainboard solution? Well thanks to the nForce2-128 SPP Northbridge chipset, the AU11 supports any 200/266/333 MHz based Athlon processor, even the upcoming Barton based Athlon's so upgrade paths are clean and simple. There are three DIMM slots for a maximum of 3 GB of PC1600/2100/2700/3200* (* there is no JEDEC PC3200 standard) memory, but since the NF2 is able to take advantage of dual channel DDR, you'll really just want to populate the first two slots with identical memory types/sizes. The FIC AU11 also includes other goodies like on board IEEE 1394, 10/100 LAN and 5.1 audio. 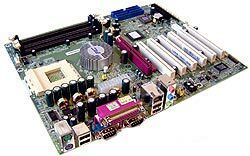 In terms of expansion room, there are six PCI slots and a 4x/8x AGP port with a maximum AGP interface bandwidth of 2.1GB/second. 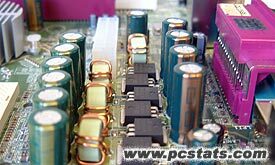 FIC have never really been after consumers hearts with flashy coloured PCB's, or other gimmicks. Rather, as we can see with the AU11 they're simply delivering a good combination of value and performance. With most of the features we now come to expect based on chipset level support, it has become very inexpensive for manufacturers to include them - no extra hardware is required for USB, LAN or Firewire support anymore in most cases. I personal like that more and more manufacturers are including on board 10/100LAN as standard equipment, with broadband becoming more popular, a NIC card is now just one less thing you need to purchase. If you use high bandwidth external devices, the AU11 supports both (2 ports) Firewire and (6 ports) USB 2.0. The layout of the components and sockets on the FIC AU11 is pretty good, there's nothing that really gets in the way of long expansion cards, or other parts in a small mid-tower case. Sure, the power connector isn't in the greatest location in terms of CPU airflow, but being close to the MOSFETs means a more stable voltage supply. With a total of six PCI slots, you shouldn't have any problems in terms of future expansion on the AU11. If you can't fit everything you want into this motherboard, you won't be able to with any other board on the market. While the nForce2 chip is cooled with a rather large passive heatsink, it would have been more useful if thermal paste had been used instead of the rather thick pink thermal pad. Incidently, from what we have seen thus far in nForce2 boards it doesn't seem like IDE RAID is being supported on very many models.